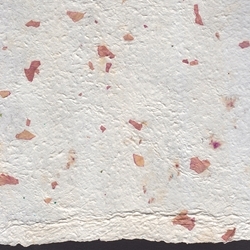 This gorgeous paper comes to us from a Mexico, where skilled artisans have been producing amate paper for centuries. The culture of amate paper dates back to pre-Columbian Meso-American times. Amate paper looks amazing if you simply frame a sheet as ready made artwork. Also terrific for bookmaking arts, collage, multimedia artwork, paper sculpture, lampshades, and more. Solid Amate paper is often used for gouache paintings. It can also be used for acrylic painting. This amate is very unique in that it has pieces of dried bougainvillea flower petals embedded in it!